The party chief made the request yesterday during a meeting of the Standing commission of the Central Steering Committee on Anti-corruption, presided by Trọng himself, to review progress and give directions on cases under the committee’s ‘special supervision’. The standing commission said efforts by relevant authorities – police, military, and the justice branch and the Government Inspectorate – in following the directions by the steering committee, resulted in laudable achievements that were recognised and appreciated by the public. According to a report by the commission, judicial bodies have completed investigations into five cases as ordered by committee, issued convictions in three cases, and completed legal proceedings in seven cases involving 60 defendants. 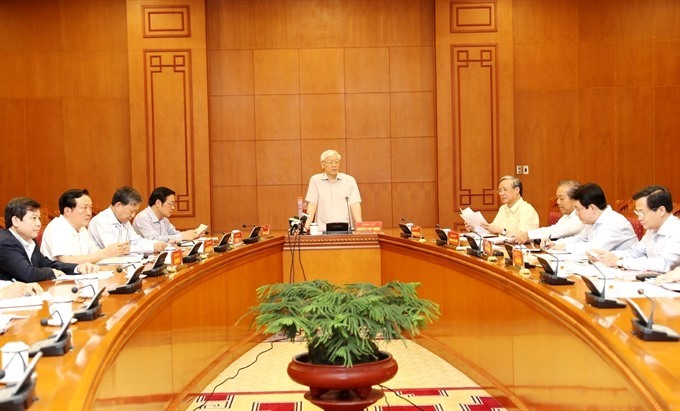 The committee expressed special appreciation towards the enforcement and judicial authorities in dealing with three major corruption cases – Trịnh Xuân Thanh’s mismanagement during his time at the helm of the State-owned PetroVietnam Construction JSC (PVC) and PetroVietnam Power Land (PVP Land), and serious abuse of power to misappropriate assets taking place at the oil group PetroVietnam involving the loss of US$35 million in capital contribution to the near-bankrupt Oceanbank. General Secretary Trọng said the above achievements were the best manifestation of the Party and Government’s anti-corruption efforts. The Party leader said that by going after even military and police officials or retired senior Party members, the Party demonstrated that there was no such thing as a ‘no-go’ zone in the fight against corruption and that it was fully committed in ensuring its integrity. The Party leader also underlined the need to bring to light the case of “organising gambling and money laundering” in the northern province of Phú Thọ that involves several senior police officials, the abuse of power case in Thái Sơn company under the Ministry of Defence, as well as the problematic acquisition of the private Audio Visual Global (AVG) by the State-owned network operator Mobifone. “The fight against corruption is particularly dificult as it is the fight against ourselves, while external hostile forces waste no time in twisting the facts, but the achievements we have gained are praiseworthy,” General Secretary Trọng said, adding that “total objectivity and a clear, uncompromised mind” is of utmost importance. ‹ PreviousAustralia’s foreign policy White Paper: What does it say, and what does it mean?